Lexington, a town of only a few thousand people, was once a bustling center for Jewish merchants. This county seat of Holmes County built itself on the cotton economy, a system that not only produced local careers in farming but also in shopkeeping. Throughout much of Lexington’s history, Jewish immigrants arrived, bringing their skills and experience from Europe to an area flush with economic opportunity. Jews opened stores ranging from groceries to dry goods and clothing, such as Cohen’s Department Store, a business still in existence today. Jewish residents of this cotton center touched the community in many ways, and some of their businesses even spanned across the United States. Lexington was incorporated in 1836, and the first Jewish settler came to the area as early as the late 1830s. Jacob Sontheimer of Germany came to Holmes County, where he took a position as caretaker of an elderly plantation owner named Mr. Johnson. Mr. Johnson appreciated Sontheimer’s service, and when he passed away Sontheimer received Johnson's land. Sontheimer named the 1,200-acre plantation “Sontheimer’s Place” a name that stuck ever after the family sold the property. The 1860 census lists fourteen enslaved African Americans as belonging to Sontheimer—a small number for such a large property—so he likely rented land to farmers or paid other slave owners for the labor of enslaved workers. Sontheimer also opened a general merchandise business in the 1840s in a brick building on the courthouse square in Lexington. While Jacob and his wife Mary were quite successful, the Civil War decimated the Sontheimer ventures. The family never recovered and retired from the business world for good. Despite his hardships, Jacob Sonteimer was the acorn from which the Lexington Jewish community grew. His ancestors have lived in Lexington almost ever since. Jacob’s daughters became prominent local merchants. In 1883, Rose Sontheimer and Bettie Sontheimer Fisher started a sharecropping furnishings business called R & B Sontheimer Company, which proved to be quite successful in the post-Reconstruction economy. In fact, this business grew to become one of the largest in Mississippi, and at one point, Rosa became Mississippi’s first ever individual female millionaire. Rosa eventually relinquished that title, as she married Isidore Hyman, a Jewish gentleman from Greenwood. Hyman joined their business, and the family’s success in the crop-lien system led Isidore and Rosa to amass nearly 4,000 acres of land. While the Hymans grew very wealthy near the turn of the century, Isidore never forgot about those in need in the Lexington area,running a private orphanage on his land to take care of children without homes. By the late 1870s, there were more than 20 Jewish residents in Lexington. Like the Sontheimers, most of these immigrants were of German descent. By the 1890s, an influx of migrants began to arrive in the Holmes County area, coming not only from Germany, but also from Poland, Russia, and other parts of the United States. By 1900, the Jewish population of Lexington reached fifty people. Sam Herrman and Morris Lewis took Lexington’s grocery businesses to a new level. Herrman, born in Davisborough, Georgia, was the son of Abraham Herrman and Lexington native, Celia Sontheimer. Abraham Herrman had immigrated from Bavaria, and lived in Georgia before heading to Lexington for the economic opportunity it afforded his family. Morris Lewis was a young man from Poland who moved to New York at age 13. Although he received no formal education there, he learned English as a shoe-shine boy. While New York life brought opportunities to Lewis, in 1890 he decided to join some of his relatives in Sidon, a small town south of Greenwood, where he could earn $25 per month as a store clerk. 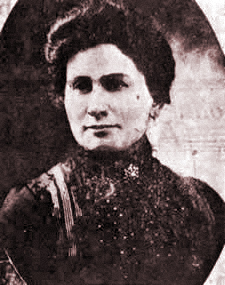 Sam Herrman married Flora Levy of Vicksburg in 1898. Morris Lewis also found a bride in the area, Julia Sontheimer, a granddaughter of Jacob Sontheimer; the Lewis couple married in 1900 in Lexington’s First Methodist Church since there was not yet a synagogue in Lexington. After his marriage, Morris Lewis came to Lexington, where he connected with Herrman, his distant relative.By the turn of the century, Herrman and Lewis started a grocery business together called the Lewis-Herrman Company. Lewis and Herrman were very successful, and the grocery business eventually merged with other local grocers including the Barretts in 1915 and the Gwins in 1916. In 1922, Morris Lewis created the wholesale Lewis Grocer Company, which supplied grocery stores around the region. Lewis Grocer Company became the precursor for Sunflower Food Stores, an independent grocery chain that still spans across Mississippi. Through their success, the Lewis family also created Foodway Grocery and Mr. Quik Convenience stores. From a company using buggies, mules, and a new Model T (costing $350 in 1916) to new modern warehouses in Sunflower’s eventual home in Indianola, the Lewis family had great success as an independent grocer and wholesaler. In addition, the Lewis family also owned a Coca-Cola bottling plant in Lexington. Interestingly, Lewis did not believe that Coca-Cola was ever going to be a lucrative product, so he sold his franchise before the soda became a gold mine, a memory that his relatives still joke about. While the Lewis and Herrman families accomplished much for themselves, they also made many contributions to the community. They brought a cotton press, an ice factory, a cotton oil mill, a waterworks system, and a sewage system to the Lexington community. Morris Lewis helped found the Lexington Rotary Club and served as the first chairman of the board of the hospital in Holmes County. He organized the first electric light company as well as Merchants & Farmers Trust Company of Holmes County. Created in 1905, the trust company was such a priority for Morris Lewis that he mortgaged everything, including his own grocery store, to guarantee collateral for the bank. Lewis believed in being faithful to his customers and justified his actions to his family by arguing that he could not be in business without his neighboring customer farmers. The Lewis Grocery Company was a catalyst for the Lexington Jewish community--many Jewish families moved to the small town of Lexington to work for the business. By 1905, Lexington Jews had formed a congregation, Temple Beth El. The land for the synagogue and the congregation’s cemetery was donated by Herrman and Lewis. 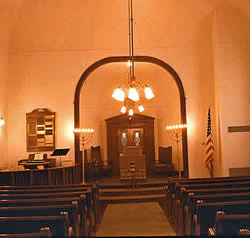 Lexington is the smallest town in Mississippi that has supported a Jewish congregation for a significant period of time. Temple Beth El has remained active even as its numbers have declined in recent years. By 1908, nearly 60 Jews lived in the Lexington area. Their numbers continued to grow well into the 1920s. By 1927, 80 Jews lived in the town. The Great Depression caused a drop in the town’s Jewish population, which was followed by further decline. While cotton was strong during the “Roaring Twenties,” dependency on cotton soon led to the downfall of this Jewish community. With the cotton economy struggling, Jewish businesses closed, causing many Jews to leave for areas of greater opportunity. Today, only a few Jewish families remain in Lexington. Despite its small numbers, the Jewish community of Lexington has always been very close-knit; indeed, many community members were distantly related to each other. Though the community is on the verge of fading out, Lexington has been a great small town Jewish success story. Lexington Jews have always been closely integrated into the social and economic life of the town, have kept Jewish life present in Holmes County.